We’ve been very busy lately working on all sorts of new projects – one of which involves our charming friend Vaness Sicotte from Damask et Dentelle and her new tv show Sauvez Les Meubles. 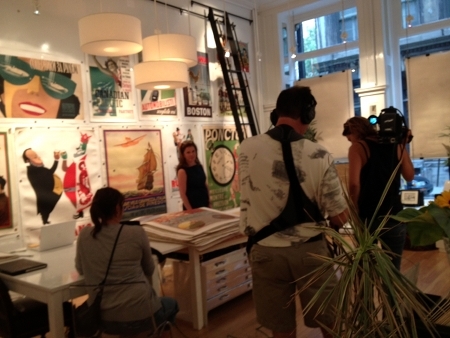 L’Affichiste will be featured in an upcoming episode and we couldn’t be more excited! Thank you Vanessa! Needless to say, we haven’t had much time for blogging, but here are some photos from this week’s taping to hold you over until the next post! Filming episode 9 of Sauvez Les Meubles (Canal Vie)! Hosted by the lovely Vanessa Sicotte! Karen feeling like she’s on The Bachelorette, as the sound tech sets up her mic.